These sparkly soaps are perfect for the bathroom, in the kitchen, or any sink as an alternative for an ordinary bar of soap. 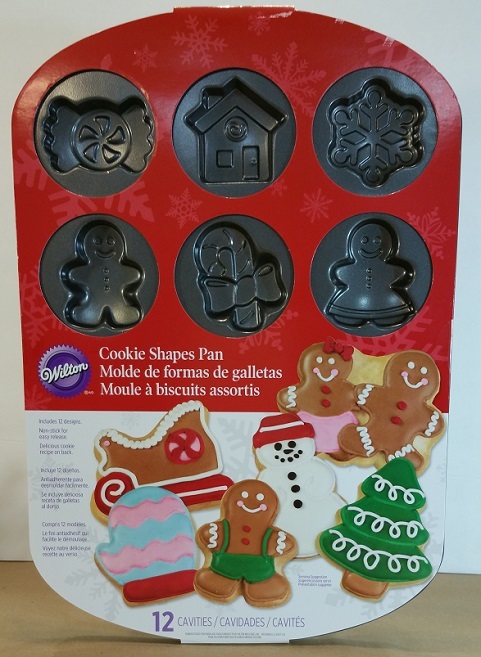 shaped mold(s)- I chose a non-stick Christmas themed cookie sheet for this project. Optional: small gems or very small toys (to add Seek And Find fun to the soap). 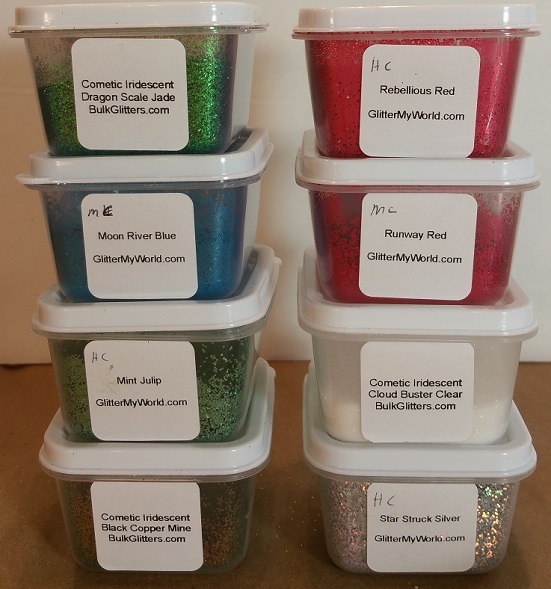 I do not recommend using craft glitters as the glitter soap will be too abrasive and the glitter may melt into the melted raw soap. 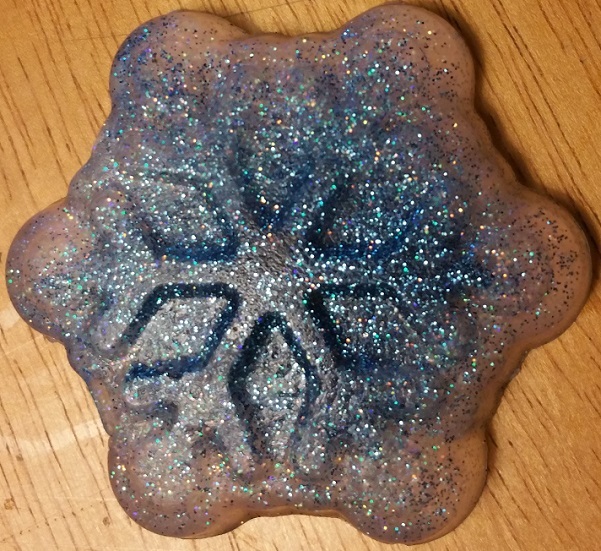 Just before you melt the raw glycerin soap, spray each shape of the cookie sheet with the cooking spray fully. 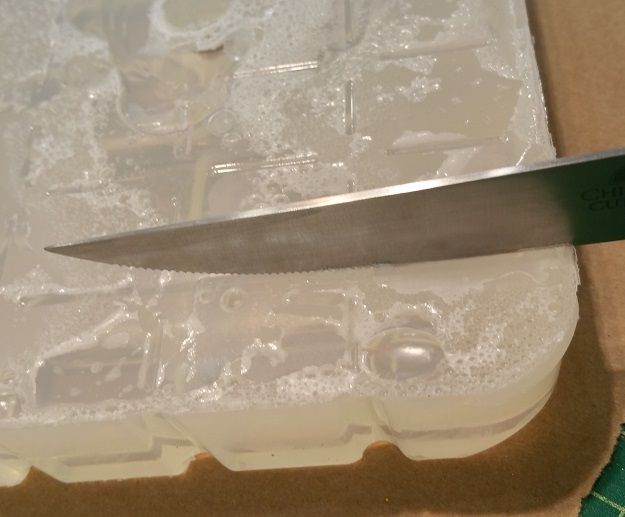 If you do not use enough spray you will have to use a butter knife or spoon to dislodge the shaped soap and this will cause some damage to the edge of the soaps. Any excess cooking oil will be washed off once you have completed this project. 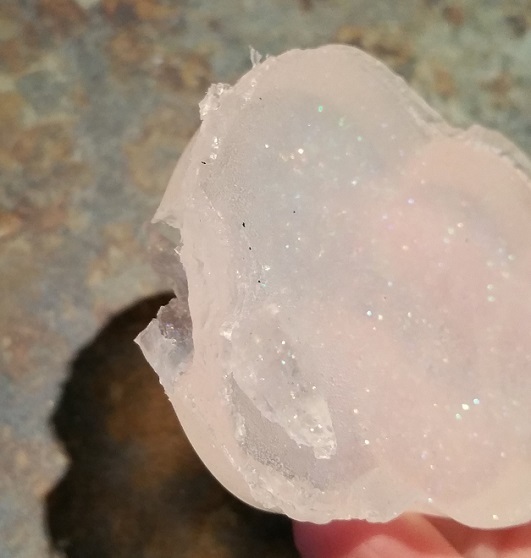 I found out that if I cooled the cookie sheet down (by placing it into the freezer for ten to twenty minutes) the glitter soap solidified faster, thus keeping the glitter well suspended in the soap. 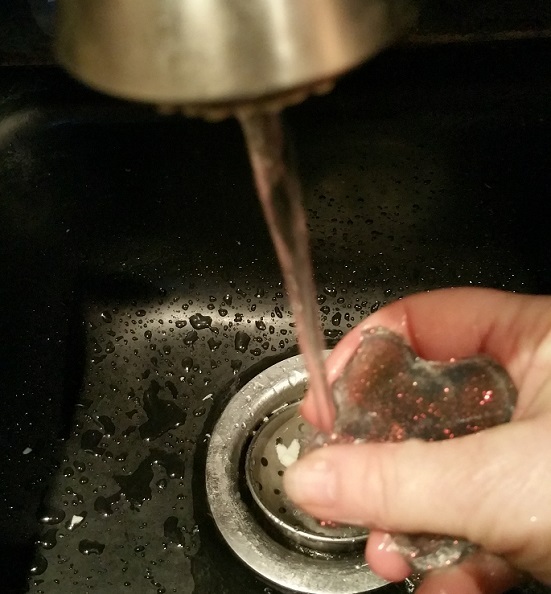 If the soap cools slowly the glitter can settle to the bottom of the pan and thus only one side of the soap looks glittery. 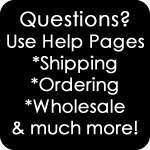 Raw glycerin soap comes in bricks or tubs. 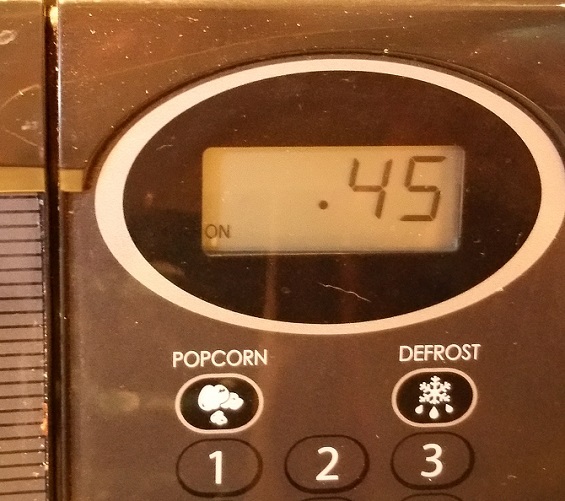 You will need to cut out the amount of soap into smaller bits, then place the bits into a microwave safe cup or bowl. I found that one square of the Life of the Party Clear Glycerin Soap filled one of the shapes of the cookie sheet I chose. It turns out to be five 1/4 inch thick, one inch by one and a half inch pieces. 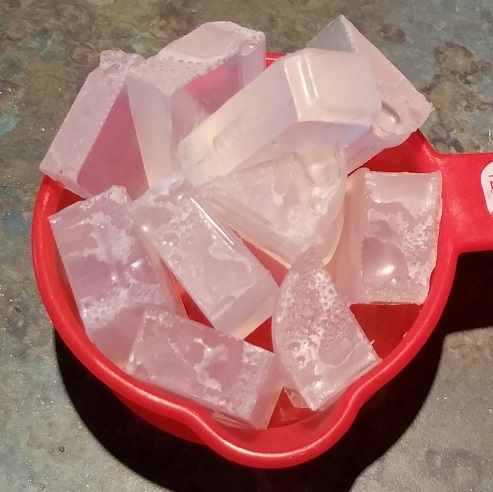 To melt the raw soap, place the microwave-safe measuring cup or bowl (filled with the cut up glycerin soap) into the microwave for 30 seconds on high. Make sure to watch the soap as it melts, so as not to burn the soap. Stir the soap to make sure it has completely become liquid. Heat a bit more if necessary (the melting time varies based on the quantity of raw glycerin soap you are melting, the altitude you live at, and the type of raw glycerin soap you have purchased). It took thirty seconds to melt half a cup of cut up glycerin soap. 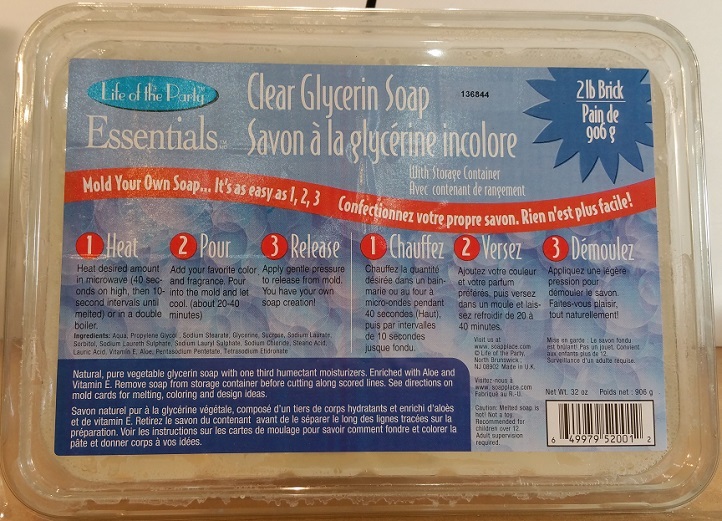 If you choose to melt the glycerin soap on the stove top, make sure to use a nonstick pan or a double boiler, have your heat or flame on a low to medium setting, then watch and stir until the raw soap is fully melted, then immediately remove from the heat. 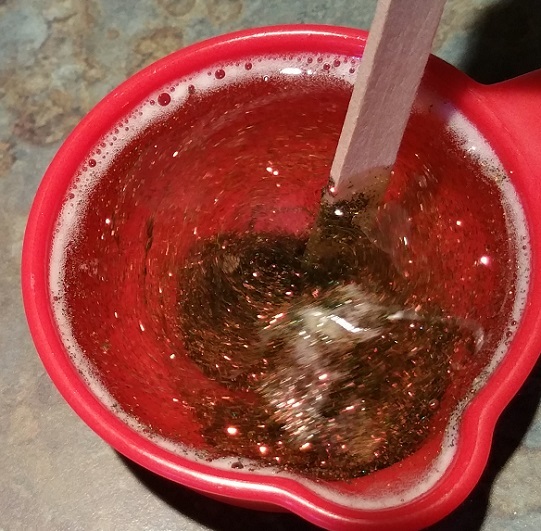 Then you will pour the glitter into the melted soap, add the essential oil(s) you chose and stir the mixture. 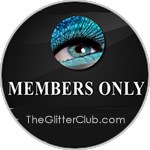 If you are using a mixture of glitters you may not want to mix the glitter into the raw soap too much. 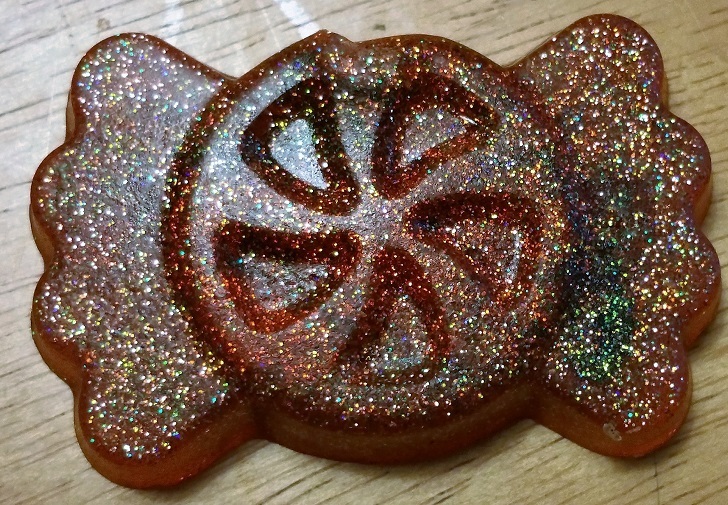 The liquid glitter soap is then ready to be poured into the cookie shape(s) you have chosen. 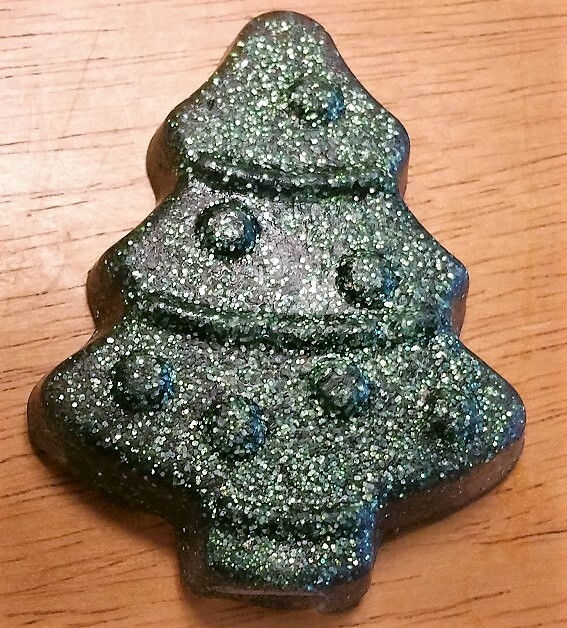 Once you have filled all of the cookie shapes you wish to fill, place the cookie sheet into the fridge or freezer to solidify the glitter soap quickly. 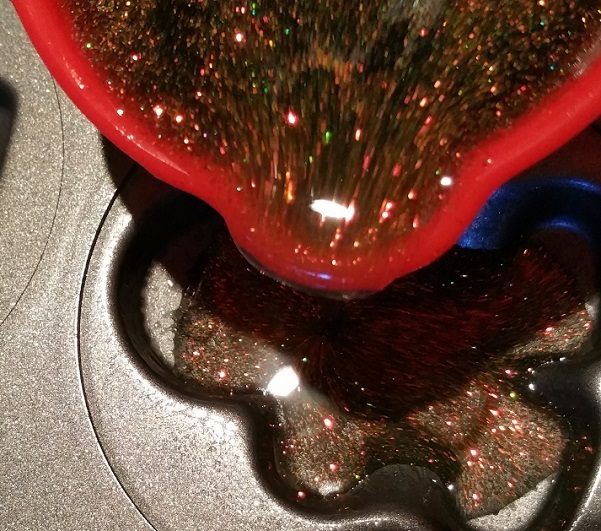 The faster the glue sets the better the glitter is suspended in the soap. 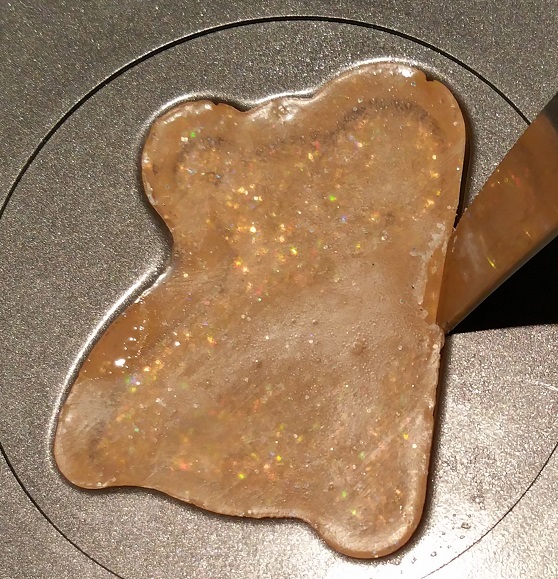 Once the glitter soap has solidified (about 5 to 15 minutes depending on the coldness of the pan and if you use the freezer or fridge to help the soap to cool down), the soap will fall out of the shapes of the cookie sheet. 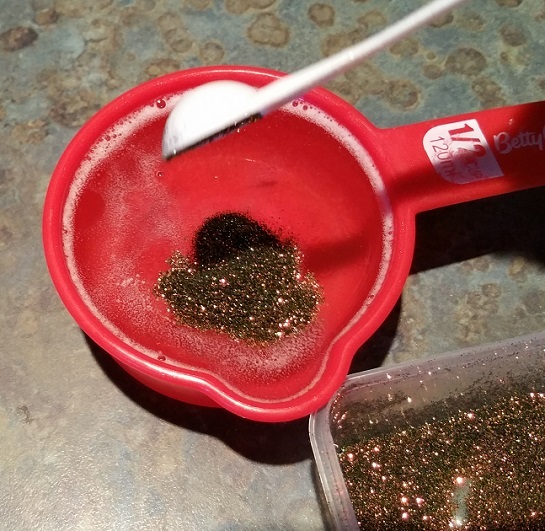 If you did not use enough cooking spray you will need to pry the soap out with a butter knife or spoon, which can cause fixable damage to the edging of the glitter soap. I did not use enough cooking spray to show the damage that can occur when you have to pry the soap out of the cookie sheet. Once the soap has been taken out of the molds a quick wash softens sides and gets rid of any dull finish that refrigerating may have caused. A quick wash will also help to fix the damaged edge if you have to pry the soap out of the cookie sheet shapes. 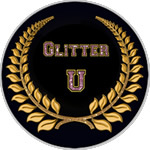 If the soap solidified slowly you may find that the glitter has settled a little, leaving you with a wonderfully super sparkly side and another side that is not as sparkly. 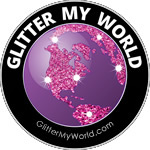 The glitter soaps came out wonderfully.